The Southern Valley's premier place to view wintering Sandhill Cranes, along with abundant waterfowl and birds of prey. Pixley is part of the Kern National Wildlife Refuge Complex. Just 20 miles away from the Kern visitor center. Background: Home to a small marsh and a significant portion of valley grassland habitat. It is the best place in the southern valley to view wintering Sandhill Cranes. The Pixley Refuge hosts up to 6,000 sandhill cranes during the winter months. The Refuge also provides great waterfowl in the winter. Birds of prey are likely to be seen. Golden Eagles occasionally fly by as well as the very aerobatic Peregrine Falcon that makes quick attempts to take out waterfowl and shorebirds. The Refuge often gets rare and uncommon species such as Eurasian Wigeon and Fulvous-Whistling Duck. Keep your eyes open and you might even catch a glimse of the endangered Kit Fox, Tipton Kangaroo Rat, or the Blunt-nosed Leopard Lizard. The most common mammals that can be seen on a regular basis include Coyote, Black-tailed Jackrabbit, and Ground Squirrel. Badgers are also present on the refuge, but they might take a sharper eye to see. The Habitat: Riparian habitat makes up the smallest percentage of the Refuge, less than 1%, while uplands (grasslands and vernal pool) makes up the remaining percentage. The Experience: The Refuge protects sensitive vernal pools and their associated flora and fauna. Wildlife and Where to Find It: Visitors park at the Refuge parking lot where the trail head begins. 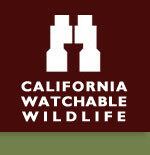 Wildlife viewing is done on foot from the 1.5 mile self-guided interpretive trail. Viewing Tips: A spotting scope is a good idea because you are often looking at the birds from quite a distance. Birding is best done during the winter months for sandhill crane and waterfowl. Spring is also good for Orioles and other migrant riparian species. The morning is by far the best time to visit the Refuge. Site Notes: Visitors are encouraged to visit the Refuge at sunset to see the evening fly-in of up to 6,000 sandhill cranes. Festivals & Events: The Refuge is the visited regularly by Tulare County Audubon Society and is a venue for field trips in association with the Kern Preserve Bio-Regions Festival. Road Hazards: Road to the Refuge is in moderate condition. How to Get There: From State Highway 99 at the community of Earlimart, exit at Ave. 56 and drive west for 9 miles. At Road 88, drive north for .6 miles. The Refuge parking area is located just over the Deer Creek bridge on the west side of Road 88.